How to use SUP for stand up paddling. Have you ever gone out of breath during a normal session of paddle boarding? You must have felt arm pains in the early sessions, but don’t worry, you are not the only one who has gone through this during the initial stages of SUP. Water sporting can be quite fun making you enjoy the summers with effective skills of paddle boarding. To enjoy the best time in water, you need training, skilled arms and an apt body positioning along with good lungs. Make sure that you are committed towards paddle board training that is the best work out that can make you fit and healthy. Effective paddle training is all about strengthening your shoulders and biceps and building the best strokes. To get that endurance, you need to practice more and more. If you have a swimming pool near you, it can become easy for an intensive paddle training twice or thrice a week. With this, you will tend to generate higher speed per stroke. Firstly, you need to look at the waves before going on water. You need to be comfortable with the sizes of the waves first. If you are feeling uncomfortable with the higher sizes of waves, choose a less crowded surfing area of smaller wave sizes. Make sure that you do not paddle where others are already paddling, that’s not a good paddling etiquette. Effective body movement - Body movement ensures effective paddling and surfing in water. Along with extending your arms, focus and concentrate on movements, open your torso, making a deep stroke into the water. Your body positioning is extremely important that enhances your control and grip on the board. You need to ensure that your non paddling arm is not dragging a bit; and the right advice for your paddling arm is to bend your elbow, trying to push the body upwards and lift the chest. To handle waves better, you can paddle sitting down, that helps to reduce the wind resistance. Handle incoming waves - As soon as you see the waves coming; be prepared for extra energy and effort to maintain the right amount of balance on the board. You need to put your chest down at this moment, because if you lift your chest more than required, the tail of the inflatable paddle board would sink in the water causing it to drag. 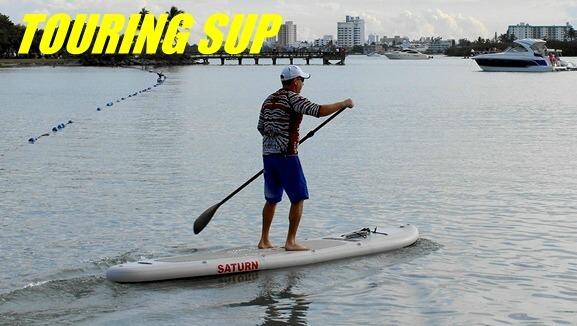 SUP stance - Balance is the key to successful paddling on the Saturn paddle board. To achieve optimum balance, you need to stand on the board in the upright position. - Keep your feet parallel that are centered between the edges or rails of the inflatable paddle board. - Make sure that you do not stand on the rails by mistake. - The toes should always point forward, your back should be straight and knees must be bent. - A great tip for effective strokes is that you must try to balance with your hips and not with the help of your upper body. - Your head and shoulder should be upright. Follow these simple tips and get started on the fun sport of Stand up paddleboarding.